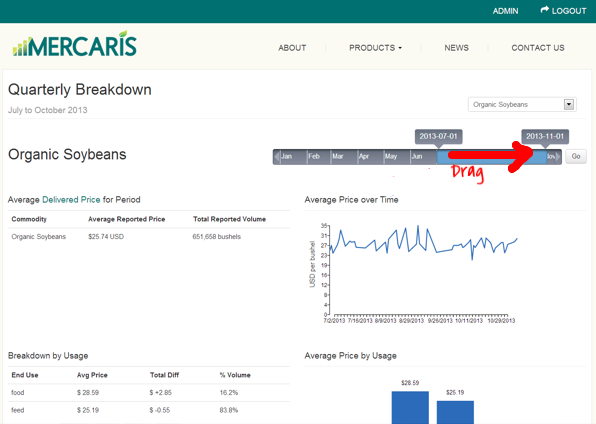 Last month we announced the launch of the Mercaris Data Service, allowing you to track organic grain prices. This month we're proud to report that we hosted the first-ever online non-GMO grain auction on the Mercaris Trading Platform. You can read more about the results of the auction here. Online trading creates unique possibilities for both buyer and seller. Auctions in particular bring interested parties together at a previously agreed-upon time, expanding the pool of available counterparties. This an efficient procurement tool for buyers and an effective marketing tool for sellers. It's especially important for new and growing markets like non-GMO or organic commodities because market supply and demand, as well as the number of participants, are changing rapidly. Another advantage is instant price discovery. Those active in these markets know there isn’t much public information available on market prices for identity-preserved agriculture (though we are working on changing this with the Mercaris Data Service). The Mercaris Trading Platform makes it possible to get the best price at any given time. And, of course, our Trading Platform offers other features that market participants can use to the advantage of their particular business. The Mercaris Platform protects anonymity, integrates a payment system to protect against credit risk, ensures prompt payment upon delivery of agreed-upon quality specifications, and is user-friendly. We’ll be hosting more regularly scheduled online auctions in the coming months. If you’re interested in accessing the Mercaris Online Trading Platform as a buyer or seller, we’d love to hear from you! Please contact Cinch Munson by email or by phone at 308-530-9443. Did you know that you can adjust the time length covered by our price reports? Just drag the timeline ticker until it covers the amount of time for which you want to see prices and traded volumes. During the recent government shutdown, we published the Mercaris Weekly Organic Grain Report to provide you with critical market data in the absence of USDA AMS reporting. Once USDA services resumed, we stopped publishing the Report (although our more detailed Market Data Reports are still available to our subscribers). We heard from many of our readers, who told us they liked the additional report! So, for the duration of the fall harvest season we’ll continue to publish our Weekly Organic Grain Report. The latest report can be accessed here.